Humminbird PiranhaMAX 176i Portable has an average rating of 3 out of 5 based on 2 user reviews. The PiranhaMAX 176i’s FSTN LDC screen features a display pixel matrix measuring 240V x 160H. Its dual sonar coverage has two modes:kHz / 16° @ -10db and 200 kHz / 28° @ -10db; sonar data will be accurate in water up to 600 feet deep. Dual beam sonar is an incredibly versatile imaging tool that offers high-fidelity imaging of the underwater environment, including topography of the bottom and clusters of fish that swim into the area.The unit’s power output is 200 Watts. The Piranha gauges the ambient temperature with its built-in thermometer, and can be programmed with up to 500 waypoints and 2000 points. 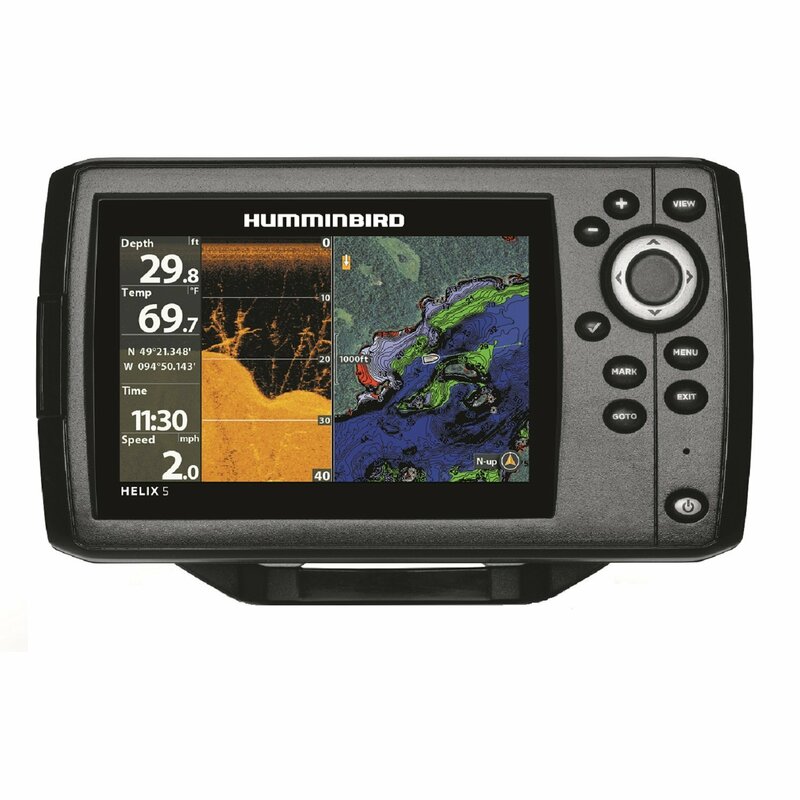 The Humminbird PiranhaMAX 176i is popular with both novice and experienced anglers. Beginners can simply turn it on and go; those with more experience may wish to take advantage of some of the Piranha’s more advanced settings. The amount of detail shown on the display can be adjusted by pressing the sensitivity button on the front of the device; anglers who want to see small fish and detailed images of underwater plants should set the detail option to “high.” This setting also reveals a lot of debris, if it’s present. Increasing the sonar sensitivity creates a busy, cluttered image that novices may find confusing or distracting; new anglers are encouraged to become comfortable with the lower detail settings before adding more objects to the screen. Many settings, including sensitivity, chart speed, depth alarms and interference filtering can be saved in the Piranha’s memory for faster setup on subsequent fishing trips. One of the most popular features on the PiranhaMAX 176i is the fish alarm; its settings may also be retained in the onboard memory. It has three settings: (1) displaying all fish, (2) displaying large and medium fish, and (3) only displaying large fish. Experienced anglers may choose to activate the Fish+ ID System, which allows users to fine-tune sonar results to reveal only certain types of fish. The Piranha uses an extensive library of symbols to represent each type of fish, which makes it easy to see if multiple species are present in the area. Online reviews praise the PiranhaMAX for its versatility; it can be used in freshwater or saltwater, and offers excellent imaging in both shallow and very deep areas. Anglers who use the Piranha remark that the “high detail” setting is incredibly sensitive and accurately identifies extremely small fish that many other sonar systems could not detect. Reviewers also comment that the Piranha’s large display is very easy to read and interpret in all lighting conditions, including intense sunlight. The user interface and mounting system are also popular with reviewers. Even anglers without a lot of experience with sonar devices remarked that they felt extremely comfortable with the Piranha by the end of their first excursion with it. The temporary adjustable tilt mount is, according to reviews, easy to position and reposition; its sturdy construction and strong attachment points provide a strong, reliable no-slip grip that keeps the Piranha where it was intended to go. You can get a great deal on Humminbird PiranhaMAX 176i Portable here. I just got this unit and used a few times already. It works well, it keeps the bottom well at lower speeds, starts to break up at about 15 miles per hour. Nonetheless, very good value for the money. I have a hard time getting this fishfinder to work. Maybe it’s my lack of experience but I had it working at some point and after making a small tweak it stopped working again. What’s even worse is the settings don’t get stored persistently, you have to reconfigure it every time you power it on.